Snow covered mountains and Spring! Following our very wet summer last year, it just seems as if we've had nothing but rain since May. Guessing that the weather was going to take a turn for the better - albeit short - we decided to head for the hills - literally - and set off the Sunday before Easter travelling north to the Lochaber area. Reputed to be the sunniest place in the Highlands we were delighted to enjoy the afternoon sunshine which provided us with some hope for Spring's arrival. However I should have taken more notice of the snow-clad mountains in the background of the photograph as this was an indication of what we would experience during our short stay. We set off from Onich and soon drove into the very busy (even at this time of year) town of Fort William. 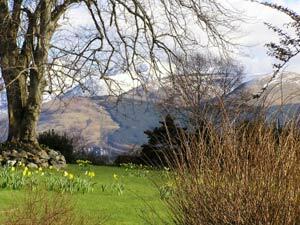 Dominated by Ben Nevis (right), the highest mountain in Britain, this is fast becoming the outdoor activity centre of Scotland. Ski on the Nevis range or just take the cable car and enjoy the scenery from a height. We did this the last time we were in the area when I was a lot younger and had no fear and thoroughly enjoyed the experience. Mountain bike racing events take place here as do dog sledging, mountaineering, cruising, white water rafting and golf - in fact just about everything you could want from the great outdoors. Even if you just wander about looking at the scenery, believe me you won't be bored, the mountains everywhere you look are spectacular. We travelled a bit further on - still on the A82 - and by late afternoon landed at our destination, Fort Augustus. By this time the lovely warm sunshine had disappeared and the temperature dropped to zero ! 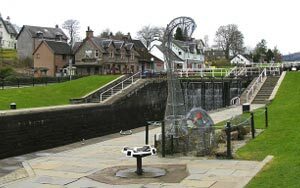 We last visited Fort Augustus about 22 years ago when it was a small stopping-off point to watch summer visitors and their vessels navigate the locks on the Caledonian Canal (left). The Canal was built by Thomas Telford between 1803 and 1822 (a busy man this Telford...) and joins the Atlantic Ocean with the North Sea, taking the sailor through the freshwater lochs of the Great Glen. Originally a popular meeting point for drovers it is now a bustling destination for tourists and it is well served by B&Bs, hotels, restaurants and pubs - which we managed to experience and enjoy. The big tourist draw in this area , apart from the scenery, is of course Loch Ness (right) and the Monster. Sadly she did not make an appearance, although we did look for her. I've always thought Loch Ness was a very sombre loch and I realised on this visit that the area is not so populated by trees and shrubbery as we are further south. We are so blessed in Argyll with an over-abundance of greenery which creates a much prettier sight than further north - probably something to do with the weather. It started to snow almost every time I took the camera out - the temperature never went above zero the whole time we were there. However this did not deter the tourists and there were a lot of them about. 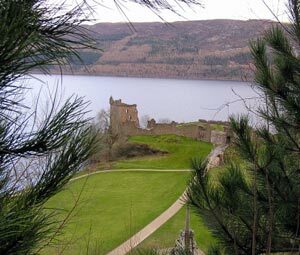 Glen Urquhart Castle (left) was particularly popular. There has been a structure of some description on this site since 1165 and it has been fought over, blown up, re-constructed and changed hands many, many times over the centuries. Here at the cottage we have signs of stirrings in the undergrowth and everything is holding back waiting for a couple of days of temperatures in double figures. Tiny anenome blanda have been flowering since February having been buried under snow, lashed with gales and rain and frozen rigid, and in the last two weeks tiny primula have been peeping out as if testing the air before they burst forth too. Two sets of triplets and three sets of twins have been born in the field over the last couple of days and it's just lovely to hear the bleating as even at a couple of days old these lambs like to explore. When they realise the 'milk machine' has moved on there's great panic for a few minutes. As I write our beautiful sunny day has suddenly gone cloudy and the wind has whipped up so I guess its time to batten down the hatches. Yet another stormy session is forecast and I've already lost the greenhouse twice this year!